Investing in a pair of prescription eyeglasses is a big decision. Depending on the type of lenses and frames you get, you may wind up spending a pretty penny. This is why it is so important that you understand how to properly care for your glasses. It’s safe to say you don’t want to deal with having to buy a new pair of prescription glasses every year, simply because you failed to properly care for them. We understand how intimidating it can be to pick out the right cleaner and other tools for cleaning your glasses, which is why we thought today’s guide could come in handy. Picking out a pair of prescription glasses typically takes a lot of time, as you want to make sure you find the perfect pair for your specific needs. People spend countless hours looking for the right frame shape and the pattern or color that matches their personality. Once you’ve made your final decision and you’ve received the call that your new glasses are ready to be picked up, it’s important you know what to do when you get them home. 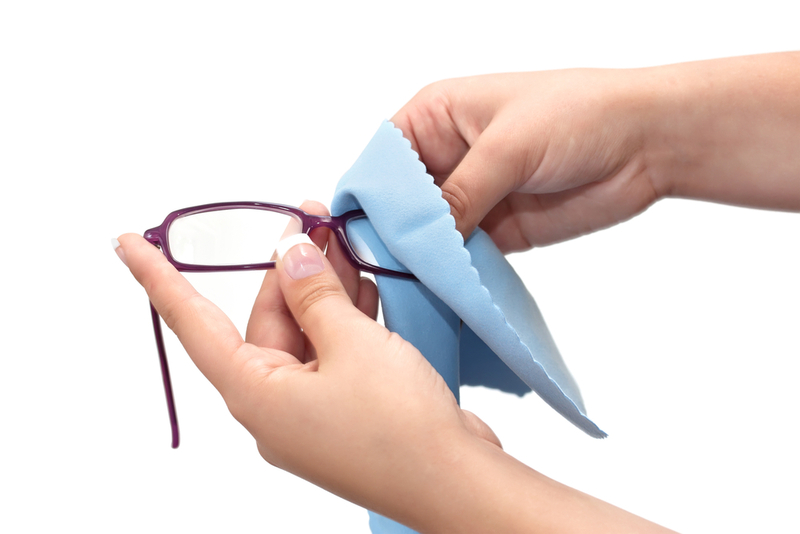 Should you clean your glasses with tissues or a cloth? Is it best to clean them when they are wet or dry? Is it OK to let them air dry? We will answer all these questions and more in the guide below. Now that you understand which products to use (and which to avoid), it’s important we look at how to wipe your glasses. Always hold the frames by gripping the small piece that runs across the bridge of the nose, but the outside of the frame. This is a much steadier grip that will ensure the frames don’t get bent when you are cleaning them. Bent frames are a common problem, but also quite preventable if you follow this simple step. Once you have the grip right, spray the glasses with the proper cleaning solutions and take your soft cloth to them, gently cleaning the lenses as you go. After they are clean, you can set them on the table to air dry, if you prefer. Always store your glasses in a hard case when you are not wearing them. We know this can be difficult to remember, but it is very important to not only keep dust and dirt away, but protect them from getting scratched or otherwise damaged. If you are thinking about investing in a pair of prescription eyeglasses, we encourage you to start by coming into First Eye Care DFW for a comprehensive eye exam. We are happy to answer any questions you may have about your glasses or prescription, so please do not hesitate to contact us today.